NGC 7252 (also known as Arp 226) is a pair of colliding galaxies well on the way to becoming a single galaxy, which displays a complex structure of stellar filaments surrounding the central core, and flung far into intergalactic space. Based on a recessional velocity of 4790 km/sec, NGC 7252 is about 225 million light years away. Given that and its apparent size of 2.1 by 1.7 arcmin, the main structure is about 135 thousand light years across, and its outer filaments stretch across more than half a million light years. NGC 7252 contains over 500 very bright, unusually blue globular clusters, whose hot young stars have Main Sequence lifetimes between 50 and 500 million years. The globular clusters in most galaxies are 12 to 13 billion years old, and contain only relatively faint, cool Main Sequence stars (such as the Sun, and still fainter, cooler stars). The young globulars in NGC 7252 must be a by-product of the collision which is turning two spiral galaxies into a larger elliptical. 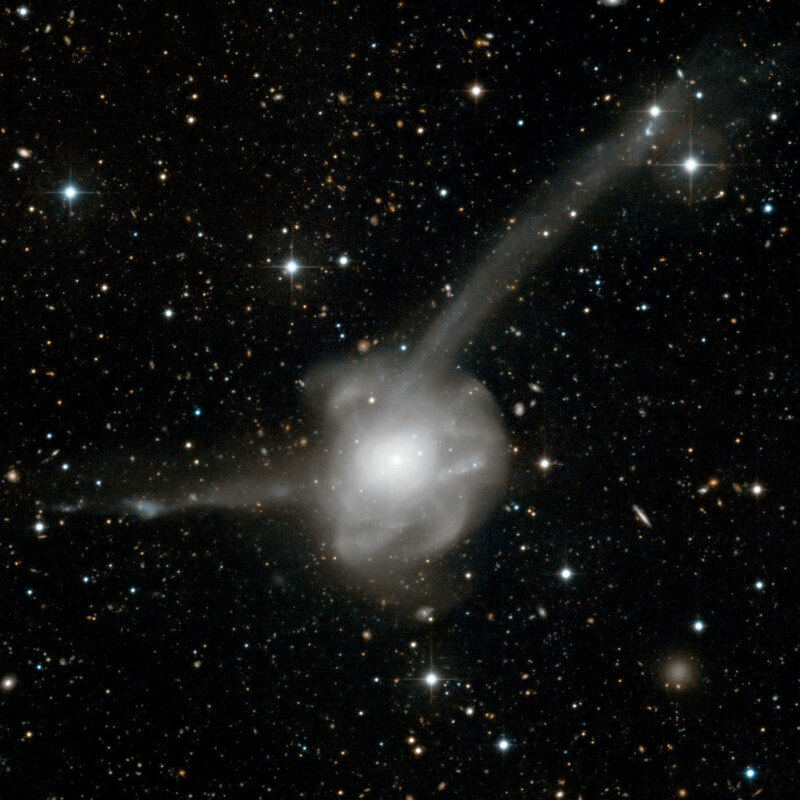 The idea that large elliptical galaxies form from such collisions has been around for a while, but such galaxies have far more globular clusters than would be expected from the combination of the smaller galaxies which formed them. NGC 7252 shows that this anomaly can be explained by the formation of new globulars during the collision. In addition to the spectacular view of the galaxy which this large cutout provides, the sky surrounding NGC 7252 is filled with a multitude of faint dots and splotches. Careful examination of the background will show that almost every one of those dots is a more distant galaxy.